Local books for the holidays | Thinking is the enemy. Many indie bookstores also have cats. Bonus! At my writing group last night we were talking about selling books locally, and got to talking about the big pre-holiday shopping days coming up next week. In the US, we often refer to “Black Friday,” the day after Thanksgiving, as one of the most profitable days of the year for retailers. When online shopping started to take off, we got “Cyber Monday.” And a few years ago, American Express began to promote “Small Business Saturday” — the day after Black Friday — to encourage holiday shoppers to patronize local brick-and-mortar stores. Instead of ordering books online, visit your nearest independent bookstore. If you don’t have an independent bookstore nearby, or just want an e-book, you can still support independent bookstores by buying online through Indie Bound. When you visit the bookstore, ask for the local authors or local interest section. Most bookstores have one. Look for books by writers who live nearby. When you patronize an indie bookseller, tell your friends on social media with the hashtag #indiesfirst. And if you’re a local author with a book to sell, by all means let your indie bookseller know! 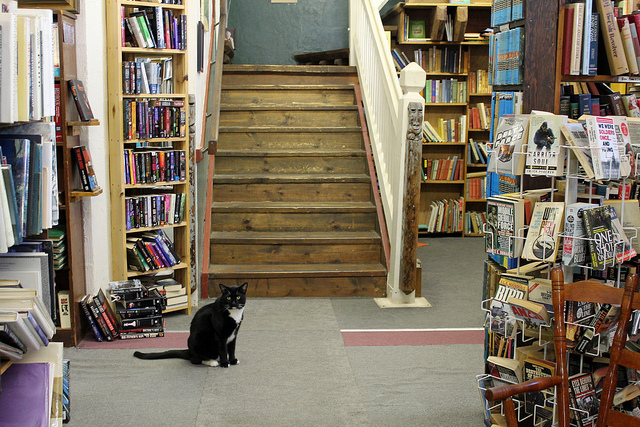 Photo credit: Bookstore cat by Sarah Stierch under CC BY 2.0. This entry was posted in Books, Marketing and tagged booksellers, bookstores, gifts, holiday shopping, independent bookstore, independent bookstores, indie bookstores, indie bound, small business saturday. Bookmark the permalink.